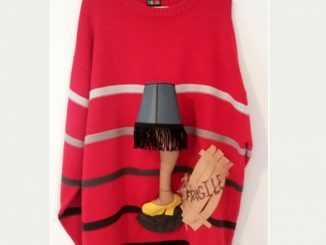 Remember those Christmas Sweater T-Shirts from a couple days ago? 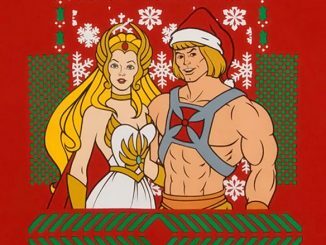 They were cool, but a bit lacking in the geekiness. 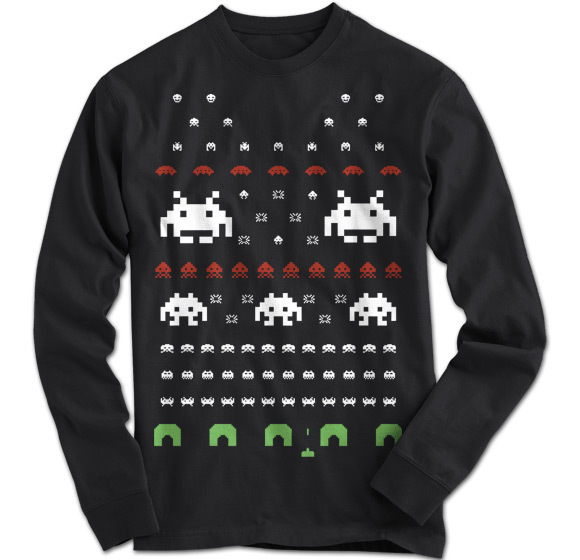 Now just add some retro-gaming goodness and you get these Space Invaders Edition Ugly Christmas Sweater T-Shirts. 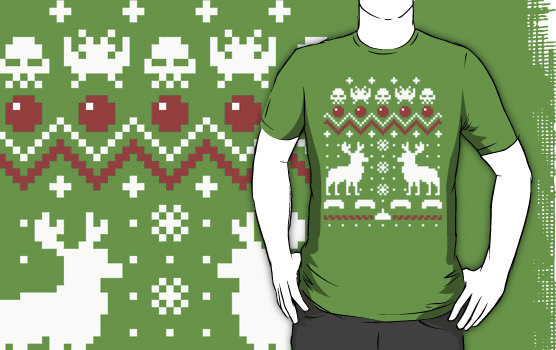 They’re space invaders tees with colors and arrangements to make them look like ugly Christmas sweaters. 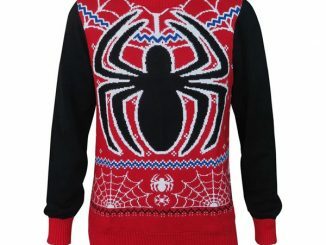 Especially with the long sleeve t-shirt, they really do look like a Christmas sweater at first glance. However, you aren’t limited to just long sleeve t-shirts, as they come in a short sleeves, v-necks, and hoodies. You also aren’t limited to this color, as you have a choice of many popular colors to choose from. 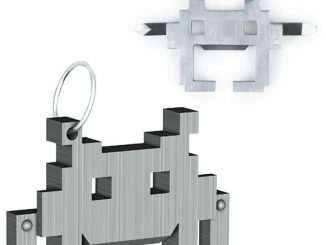 There’s also an alternative design below that mixes more holiday imagery in with the Space Invaders. 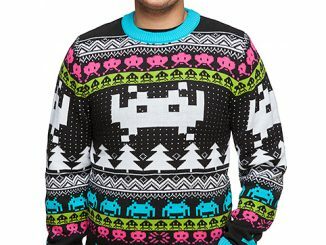 The pixelated alien horde from the classic arcade game Space Invaders has been laid out in true “Ugly Christmas Sweater” fashion. 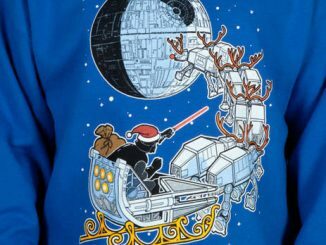 These t-shirts and sweatshirts are the perfect way to spread some geeky holiday cheer this holiday season! 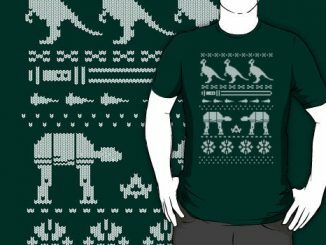 The top pictures on this page are the Holiday Invaders from Don’t Blink Tees. A standard t-shirt is $20, but they also offer a variety of styles like v-neck, women’s fitted, kids, long sleeves, and pull-over hoodies. 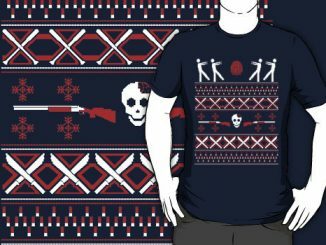 You can order Holiday Invaders (the bottom picture on this post) in your choice of shirt color at RedBubble where you can choose between short sleeve tees, v-neck tees, long sleeve t-shirts, girls fit shirts, and hoodies. 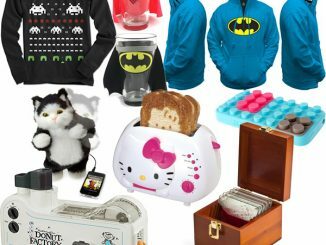 Don’t forget that you can enter our $150 RedBubble Giveaway through Dec 20, 2011 for your chance to win one of three $50 gift codes.